John C. Villforth served for seven years as a U S Air Force officer and twenty-nine as a Commissioned Officer of the United States Public Health Service. He is recognized by his peers throughout the global community as one of the most outstanding radiological health specialists of the 20th century. He received a bachelor’s degree in sanitary engineering from the Pennsylvania State University in 1952 and a master’s degree in sanitary engineering at that same university in 1954. He also received a master’s degree in physics from Vanderbilt University in 1958. On September 12, 1953, while he was pursuing his master’s degree at Pennsylvania State University, John Villforth and fellow university student, Joanne Heine, were married in Mt. Lebanon, Pennsylvania. He began his professional career as a sanitary and industrial hygiene engineer and as a health physicist with the U S Air Force. From 1958 to 1961, he was the Commander, USAF Radiological Health Laboratory. In 1961 he transferred his commission to the Public Health Service and was assigned to the Service’s radiological health program. His whole career in the PHS was in that program in progressively responsible positions. In 1969 he became the Director of the Bureau of Radiological Health after the Bureau was delegated responsibility for the regulation of electronic product radiation under the Radiation Control for Health and Safety Act of 1968. The Bureau established and enforced federal performance standards for x-ray machines, microwave ovens, various light sources, and other radiation emitting products. In addition to continuing the radiological health program, the new Center was responsible for approving medical devices for safety and efficacy and assuring that these technologies remain safe in the user’s environment. In 1979, he was appointed by the Surgeon General to coordinate the Department’s response during the accident of the Three Mile Island nuclear power plant. 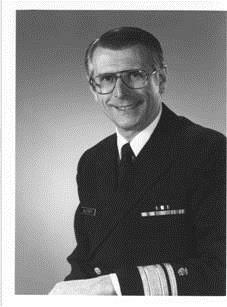 In 1985, RADM John Villforth was appointed by the Surgeon General to the post of Chief Engineer of the US Public Health Service. He held that post until the end of 1989. In August of 1990 he retired from the PHS with tenure as a uniformed service officer spanning 36 years. His Commissioned Corps awards include two PHS Distinguished Service Medals, the PHS Meritorious Service Medal, the PHS Outstanding Service Medal, the PHS Surgeon General's Exemplary Service Medal and the PHS Commendation Medal. He was also active in the PHS Commissioner Officers Association, serving for a number of years on the Board and as its Chairman in 2000. He was also Vice President and a founding member of the PHS Commissioned Officers Foundation for the Advancement of Public Health. He continues to assist the Association and the Foundation in their work. Upon his retirement from the PHS in 1990, he was elected President of the Food and Drug Law Institute (FDLI), an educational non-profit association committed to helping the industries regulated by FDA, better understand the rules and regulations assuring safe products. He served in that position until 2001. He also helped to establish an FDA Alumni Association, and was elected Chairman of the Association Board. In the year 2000, the John C. Villforth Leadership Award was established by the US Public Health Service Engineers in his honor.